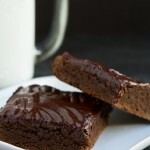 Dense and moist paleo brownies with a crisp exterior and fudgy interior. Made with cassava and boosted with greens+ powder… in your blender! Preheat oven to 350F and line an 8×8 baking sheet with parchment paper draping from the sides. Set aside. Add coconut oil, cacao powder, maple syrup and sucanat to the jug of your high-powered blender or stand mixer, or food processor. Blend until creamy, about 1 minute. Add eggs, blend again, just until mixed. Transfer brownie batter to prepared baking sheet. Slide into preheated oven and bake for 20-25 minutes. Meanwhile, make the frosting by combining all of the ingredients in a bowl and whisking until all chunks are gone. 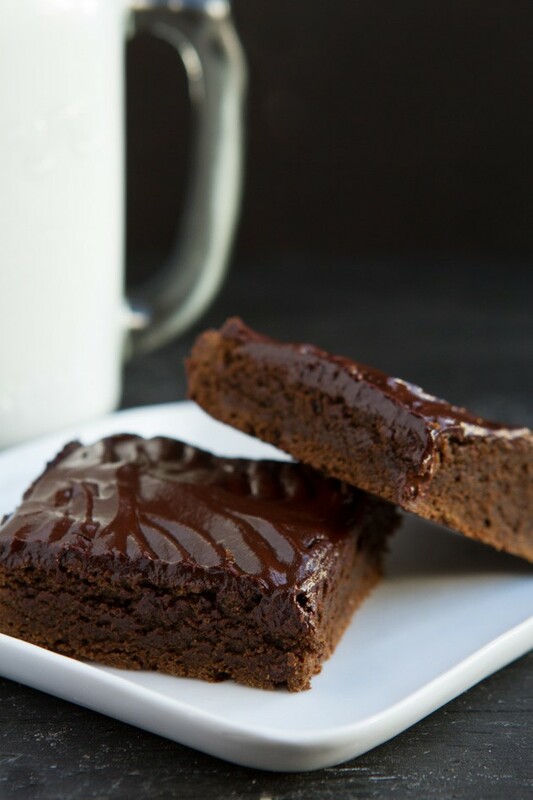 For the brownies, the edges will get crisp but don’t let it over bake! Toothpick inserted should bring crumbles along with it, not be entirely clean. Remove from the oven, transfer to a cooling rack to cool for 30 minutes. Frost and cut into 12 squares. Serve immediately or chill in the fridge until you’re ready! Egg-free/Vegan: You could try to replace the eggs for 2 flax eggs (2 tablespoon of finely ground flax seed and 4 tablespoons of warm water, left to sit for 5 minutes before using as you would the egg). Cassava Flour: I know, it’s a little bit pricey, which is why I used so little in this recipe. My bag has lasted FOREVER! greens+: How much greens you put in the recipe depends on your stevia tolerance. I liked the brownies with 4 tablespoons but Kevin preferred the batch with 3 tablespoons because it had less of a stevia taste (from the greens powder). If you don’t have greens+ just yet, you could omit it from this recipe.